 D. KLOTZ, « Egyptian Hieroglyphs », dans Chr. Riggs (éd. ), The Oxford Handbook of Roman Egypt, Oxford, 2012, p. 563-580 1 citation(s). D. KLOTZ, « Hibis Varia (§1-3): Diverse Liturgical Texts from Hibis Temple », SAK 44, 2015, p. 173-207 3 citation(s). D. KLOTZ, Caesar in the City of Amun. Egyptian Temple Construction and Theology in Roman Thebes, MRE 15, 2012 64 citation(s). D. KLOTZ, « The Theban Cult of Chonsu the Child in the Ptolemaic Period », dans Chr. Thiers (éd. ), Documents de théologies thébaines tardives (D3T 1), CENiM 3, 2009, p. 95-134 2 citation(s). D. KLOTZ, « Domitian at the Contra-Temple of Karnak », ZÄS 135, 2008, p. 63-77 4 citation(s). D. KLOTZ, Adoration of the Ram, YES 6, 2006 2 citation(s). 4 986 640 visites - 2 157 visite(s) aujourd’hui - 8 connecte(s).